Who doesn’t love a vacation? 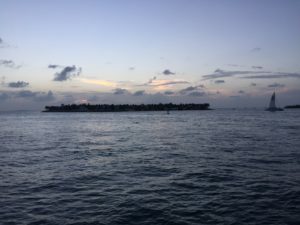 This past weekend my boyfriend surprised me with a trip down to Sunset Key, a private island off of Key West owned by Starwood Hotels and private residents. 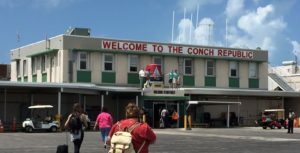 Welcome to Key West, the Conch Republic! 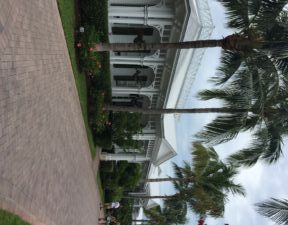 While the resort is associated with Westin, who has a traditional hotel on Key West, you check in on Sunset Key itself. 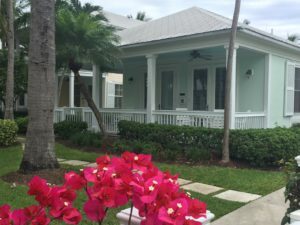 From there, the concierge personally walks you to your cottage and gives you the resort rundown (boat schedule, breakfast information, pool and beach info, etc). Each cottage is given a super cute name. Our cottage was called “Easy Dreams,” which is a little ironic considering some of our morning experiences, but I’ll get into that later. 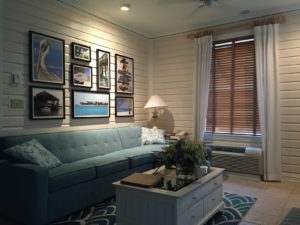 The cottage has 2 bedrooms (1 with a king bed, the other with two double beds), 3 bathrooms, a lovely living room/dining area, functional kitchen minus an oven, and a beautiful wrap around porch with rocking chairs. Outside there were also two shower heads on the cottage for rinsing off after a day at the beach or in the pool. The resort is beautiful, peaceful, and comes with some awesome amenities. 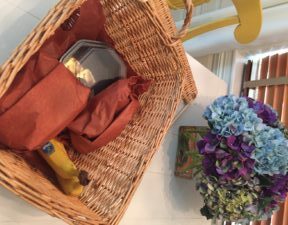 One of my favorite touches was that every morning each cottage would receive a breakfast basket on their porch. Included in your basket were muffins, croissants, butter/jam, and a couple pieces of fruit. 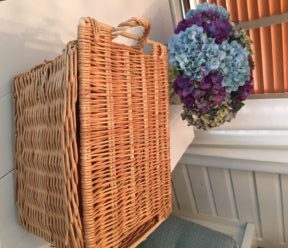 It was so magical opening the door every morning to find a cute basket full of goodies (all included in your stay). Each morning the quantity varied. 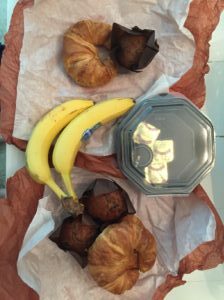 One morning we received 2 muffins, 3 croissants, and two pieces of fruit…a lot of food for two people. Other mornings we received smaller amounts of baked goods. Most mornings we couldn’t tell what type of muffins we received and there was no note saying what you received. On our second to last morning one of the muffins was blueberry, which is what I was craving the whole time. It was absolutely delicious. I only wish we could have requested what we wanted. 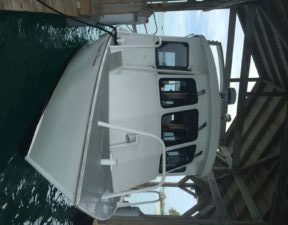 Onto the water! The pool was quite nice with an accessible gradual slope, and optional ladders in the deeper ends. There’s also a hot tub or two around the pool area that you can check out as well. You’ll also find a bar that serves food at the pool. We didn’t eat anything there, but probably would have if we could have eaten off the kids menu 🙂 (disclaimer: we didn’t ask if it was allowed or not). Sunset Key also has a beach available to guests. 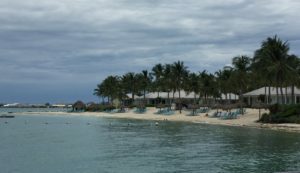 Apparently vacationers staying in the Westin on Key West are able to use the beach, but I think I only saw one couple take advantage of that the 4 days we were there. The beach itself is small, and at the water’s edge there are a ton of little pebbles and rocks that make it a bit painful to get into the water, but after a few feet things smooth out and you can walk on some patches of sand or some larger non painful rocks in the water. Two of my favorite things about the beach were that there were minimal waves and the water was the perfect temperature. The only time the beach had any waves was when speed boats or jet skis would pass nearby. I hate waves, so this beach worked out nicely for me. In regards to the temperature of the water, it wasn’t cold at all. I would say it was more refreshing than anything, something that was very welcome with the high humidity on the island. Little treats being left every night after turn down. The first night there were chocolates left by the bedside. We also received Key Lime cookies. 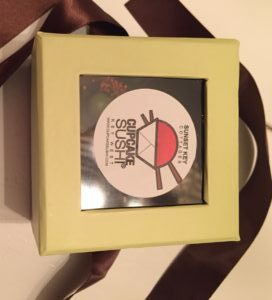 However, the coolest treat left was two little boxes of Cupcake Sushi. 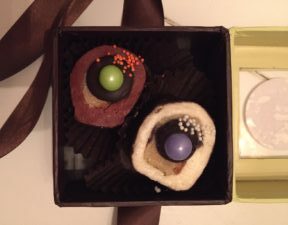 What’s Cupcake Sushi you ask? Cute bite sized bits of cake (cupcake) surrounded by buttercream frosting, dunked in dark chocolate and decorated with chocolate pearls to look like a little piece of sushi. Delicious!! 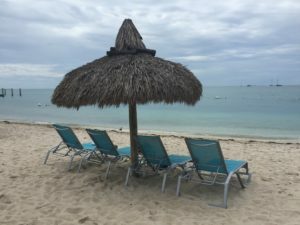 Not many food options – the resort offers a restaurant but none of the options were super appealing or exciting for us (we’re not into fancy food). Next time I might try ordering kids menu items from room service. Sunset Keys is an amazing place. I hope I get a chance to go again. Definitely a place I would recommend if you want to check out Key West but want to avoid being around the whole party scene 24/7. What to order: Bar Pizza – perfect size to fill you up, super cheesy and delicious. I got pepperoni! Summary: Fun evening tour that takes you around in a “spooky” trolley. You’ll get to see interesting historic buildings and learn about their history, and hop off at two stops (a fort and a museum). It’s not scary (unless you disrespect Robert), but is super informative, fun, and something different to try. 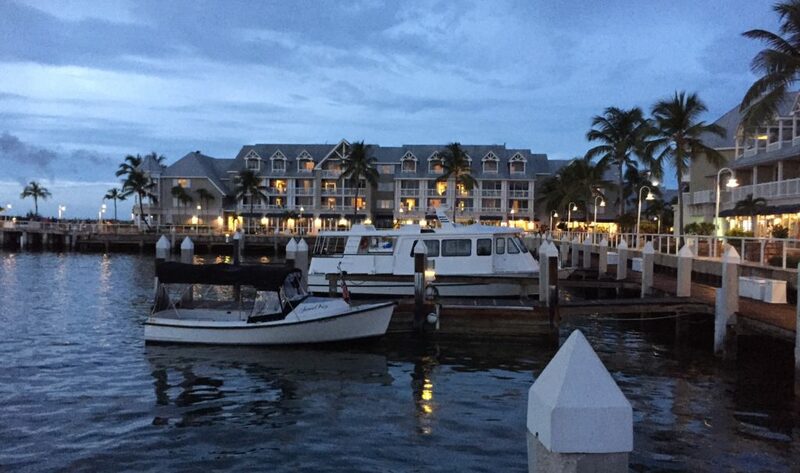 Summary: For me beach towns = fish and chips, but it’s a hard dish to come by in Key West. Red Fish Blue Fish is a great spot to chow down on traditional fish and chips. Plus, they had quick service, an air conditioned dining room (there’s also an outside patio area), and tasty food. Pokémon Go. 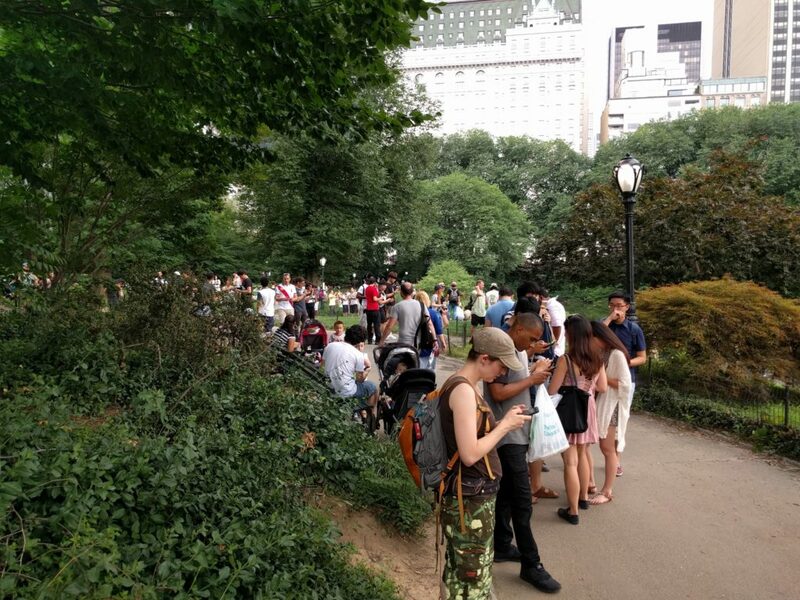 Everyone’s heard about it by now, from the stories of stampedes in Central Park to people coming across dead bodies while they search for a rare Pokémon. I jumped on the bandwagon and I’m not ashamed to say it. Growing up, I was a part of the generation who was still a kid when Pokémon became a craze in America. From TV shows, toys at Burger King, and card collecting, Pokémon touched the lives of many of my peers. So, when those of us 20 somethings heard that Pokémon Go launched, we couldn’t help contain our excitement and interest. 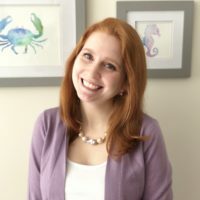 I’ve been playing the game around my town in New Jersey, and even took it on the go with me when I travelled to Austin, Texas for work, where I found myself in a wooded path outside of the office with 15 other people sweating it out, quite literally. 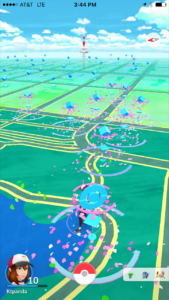 This past weekend my boyfriend, his brother (visiting from out of town), and I decided to head to the city to see if we could find some good Pokémon! Of course we headed to Central Park which is basically Pokémon Central USA. I heard stories saying there were tons of people playing in the park, but nothing compares to seeing it in real life. There were hundreds, or more likely thousands of people, playing the game in Central Park. I mean everywhere you turned there were kids, teens, and adults from all walks of life and backgrounds with their heads down chasing Pokémon, stopping at PokéStops and challenging gyms. New York City is known as a melting pot, and this past Saturday that was more than true in Central Park. It was so cool to see all sorts of people coming together in one place to find cute little critters and monsters. Back in my New Jersey town, there’s a park where I lived so we had to check it out too. While on our quest we even came across a young couple, who were expecting a baby, and even they were playing Pokémon. One thing I really appreciate about the Pokémon movement is that everyone seems so friendly, welcoming, and accepting. You don’t need to feel embarrassed walking around playing the game. While on the topic of walking around, this game is amazing for getting people up and moving. I keep wanting to go out to a local park or walk around my apartment complex to see what’s out there. Apparently sometime during the summer there will be a cool little accessory you can buy for the game, Pokémon GO Plus, a wrist accessory shaped as a map pin in the Poké Ball style that will vibrate if there’s a Pokémon or PokéStop near by. Rumors state that it’ll only be around $35, which is a great price. I’ve signed up for Amazon email notifications for when it goes on sale. If you find yourself bored this summer, and want to get some exercise, give it a try. You never know, you might even make some new friends along the way! 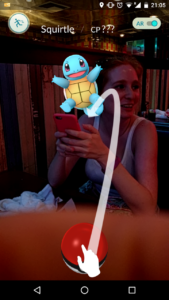 Screenshot my coworker took at dinner in Austin.